Over the Rainbow: Scrappy Sunday--coming in under the wire! I spent this Sunday trying to get back in my normal routine, with limited success. I also engaged in a little bit of self-torture infertility style, i.e. the maternity and baby sections of Target. I even found a little black and white polka dot ruffled onesie that was simply too cruel:) I was trying to think of little girls to send it to! And in just a few moments, I will get back to scrapping--it's been over a week, what with the holiday itself and all the prep beforehand. I received my gorgeous September Studio Calico kit, Back 40, and I'm raring to start cutting and pasting! But before I go lose myself in a sea of paper scraps, here are some pages I haven't posted yet using SC's August kit, Summer Camp. When S and I first met, he didn't read so often, while I DEVOUR books. I go to the library, take out 20 or so 14 day books, read like a madwoman to get through them before the deadline, and do it again. Love love love books. So after almost 2 years being married to a reading freak like me, S has started to dip into books a little more. When I found this photo of him concentrating on his book, it made me think about how much we influence each other in relationships. It's a funny thing. Are there any traits someone else had that rubbed off on you? Or vice versa? What are YOU up to this week? What scrapbooking projects are on your desk? Also, I love finding new blogs, so if you're a reader and have your own blog, please leave a link! the duck tour! yeah! how fun is that??? haha....oh the memories. i love that you rubbed off on him in a good way. my scrubster won't read to save his life. so infuriating. i even tried to get him books in his genre but to no avail. i love how you used the hambly rubon with the embellishment accent! Love the idea of a layout about traits/hobbies "rubbing off" on your spouse. I will need to think of ideas for myself! Great layouts! Love the new blog too (appears to have a new header! LOVE LOVE it!!!). AMAZING new header, did you do it yourself? 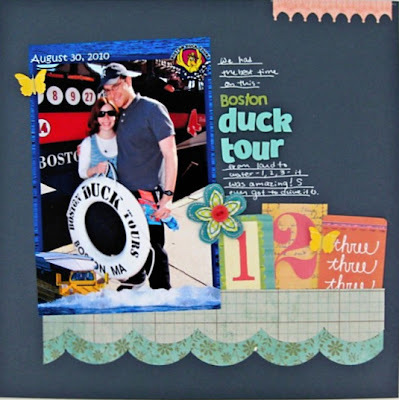 Sweet layouts, the duck tour looks like fun!!! So cool how we influence our significant others! love the pages! Awesome as always! Lovin the new header too! Love the white space and wonderful colours and elements! Great pages! Thought I was on the wrong blog, cute header. Hey girl! Did you see this yet? Hi! I've just come here via the Sketchy Thursdays blog, congrats on your place on the DT! I love your pages. Well done for managing to get your man to read, I am a book lover too but all I've managed to get hubby to read is Harry Potter! Congrats on the Sketchy Thursday DT, I always mean to do the challenge and post, so maybe I will now that I know a DT member! Woot, woot! Congrats in the Sketchy Thursday gig. You more than deserve it. I love your layout, "i've rubbed off on you" my husband and I have had similar experiences :) hope you had a great holiday!